Oslo: Hope You and Yours are OK Andreas. *update VMs!!!! I've tried to find this posted elsewhere here, but couldn't. Please forgive if it has been, but I want to pass on my hopes that you and your loved ones are safe after these hideous violences in Oslo. I plan to lay flowers at the appropriate venue in my city. My thoughts and prayers to you and your family and your fellow Norwegians. Last edited by Sponge on Thu Jul 28, 2011 6:43 am, edited 1 time in total. Reason: Mod edit: modified thread title slightly (since it has become definitely on topic) to reflect the update about the cult's volunteer ministers appearing on the scene. 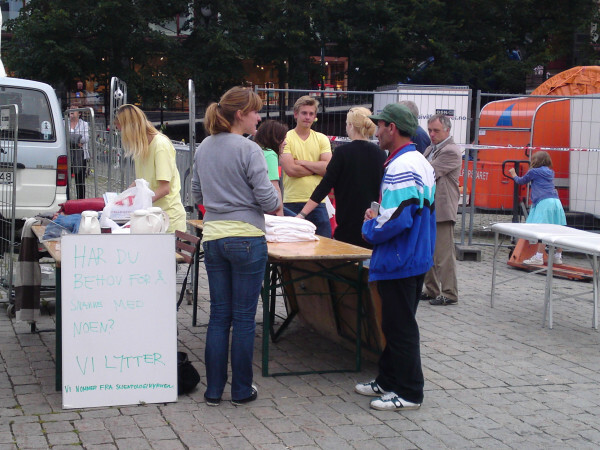 Today, despite the poor weather, he had a stand representing secular Humanism in Stavanger for anyone who wanted to talk about yesterday's events. inb4 scientology volunteer ministers PR. Andreas and any other Norwegians, I feel so much sorrow for you losing over eighty young people and others to an intolerant bigoted murderer. Please keep your wonderfully open and tolerant society while being alert to these kinds of murderers. Last edited by Sponge on Sun Jul 24, 2011 8:55 pm, edited 1 time in total. Reason: Mod edit: Merged with existing thread topic. Love to you, Andreas, and thanks, Sponge for the links. Don Carlo wrote: Andreas and any other Norwegians, I feel so much sorrow for you losing over eighty young people and others to an intolerant bigoted murderer. Please keep your wonderfully open and tolerant society while being alert to these kinds of murderers. Ditto. Sixteen years ago Oklahoma City suffered an attack by an American right wing nutcase,Timothy McVeigh. My thoughts and prayers are with you, Andreas and Norway. There are insane pople in every country. Hopefully in the future such people, whoever they are and wherever they are, will be identified, receive the treatment and/or judgement needed amd such dispictable acts will be prevented. As yet, no reliable dox to prove that for certain or where exactly they plan to show up. There are only two answers for the handling of people from 2.0 down on the tone scale , neither one of which has anything to do with reasoning with them or listening to their justification of their acts. The first is to raise them on the tone scale by un-enturbulating some of their theta by any one of the three valid processes . The other is to dispose of them quietly and without sorrow. from Science of Survival: Prediction of Human Behavior by L. Ron Hubbard. Vulture Ministers Swooping In - Fight them and their hidden bigotry with information. They're here, albeit without the regalia. The sign says: "Do you need someone to talk to? We are listening. We're from the Church of Scientology." Just a couple of tables with 3 flasks and folded towels or tablecloths. A touch-assist bench on the right I think. Wearing washed-out t-shirts in the wrong shade of yellow without even the scientology/VM logo on them. No piled-up boxes of TWTH leaflets or copies of dianetics, no e-meters. Well, none that I can make out unless they're stocked up in the van. Of course, no big ugly yellow tent. I don't know whether they are just plain shambolic or whether they purposefully didn't want the obvious scientology corporate branding for fear of people making an early and wide detour around them, and there's just the small print scrawled at the bottom of the sign "We're from the Church of Scientology" almost as if it is an embarrassing forced admission. "We listen...and tell you not to go to a psychologist or psychiatrist." "If you ask about Kara Ballo's suicide* after being terrified by a Scientology psychology test, we don't listen." Today, the sign has changed. See the fine print at the bottom. The main text still says "Do you need someone to talk to? We are listening", but the line at the end"We're from the Church of Scientology" has now been reduced to "We are Helping". Scientology volunteer's sign: Left - Tuesday, Right- Wednesday. So, no one wants "help" from the church of Scientology, so they go undercover. What a surprise. Re: Oslo: Hope You and Yours are OK Andreas. *update VMs!!!! 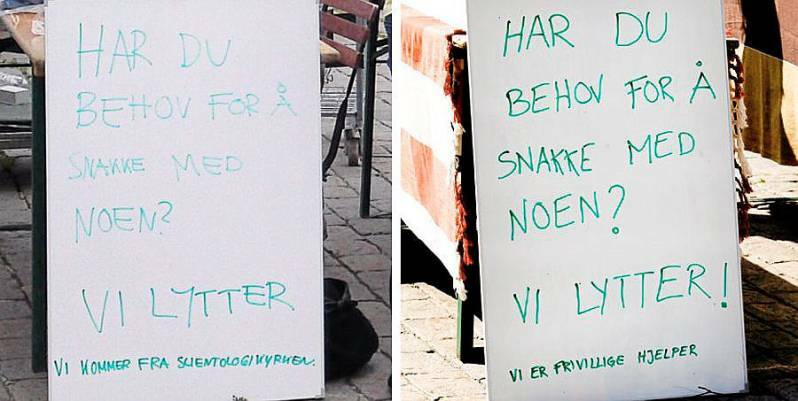 Scientology udnytter sårbåre sørgende i jagten på nye medlemmer, lyder kritikken. Scientology exploits vulnerable mourners in the hunt for new members, says the criticism. Dansk scientology har uddelt 6.000 flyers til sørgende nordmænd. 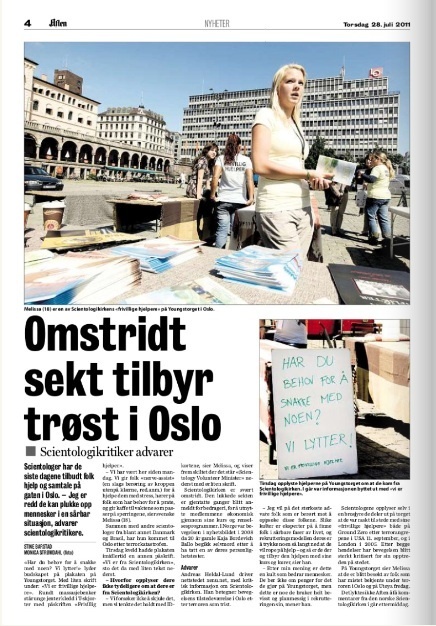 Danish scientology: "I wish, 6,000 Norwegians joined the Scientology"
Danish scientology has distributed 6,000 flyers to grieving Norwegians. They decided to put back "from the church of scientology" at the bottom. 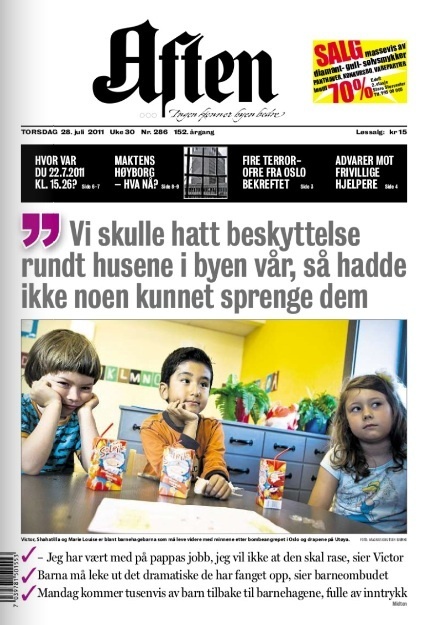 Skriv: Er det i orden, at Scientology opsøger de sørgende? Scientology kritiseres for at hjælpe pårørende i Oslo. Post: Is it OK that Scientology seeks out the grieving? Scientology accused of helping relatives in Oslo. At the moment there's 17 pages of comments. People are angry at scientology's exploitation. Geir Isene wrote: After sailing in Greece since the beginning of July, we arrived back home in Oslo yesterday. Today we went downtown to see the area struck by the terror attack and most importantly the memorial place covered with more flowers than I have ever seen in my life. Strangely the air was filled with calmness and warmth where one could expect confusion and revenge. Sadness yes, but carried by a foundation of love – for those who lost their lives, for the democracy they championed and for our national integrity. I am proud to be a Norwegian. May this horrific event forge a companionship stronger than ever. In these days of healing there are of course some elements that we could do without. There are those who seek to score political points, those who will use the events to peddle their ideologies and those who will try to solicit PR in the wake of sorrow. Like the staff in the Church of Scientology in Oslo that I met close to our own Ground Zero. They were there on a recruiting mission via The Way to Happiness Foundation – as if a moral code is what the people of Norway need the most right now. The usual practice for the church is to ensure any such event would be used to bolster their image. Knowing that the church actually works hard to support a power hungry cult leader makes such exploitation of willing staff a disgrace. In times like these I honor those who give unconditional help, those who give without thought of reward.